Kia’s premium executive sedan challenges the definition of luxury again to become the vanguard leading the fleet of Kia innovation. We’ve taken the latest technology and features from across our family of models, and infused them with the classic comfort and premium experience of the K900 to make it the most advanced Kia to date. 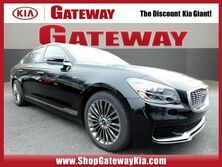 Designed and engineered by the same Albert Biermann team that wowed the world with Kia’s Stinger GT, the K900 boasts confident driving dynamics and commanding presence. New enhancements focus on drivability, comfort, reduction of noise and vibration, and steering precision. The resulting superior driving experience delivers sustained high-speed travel with optimal stability, reliability, comfort, and control. Quiet is the ultimate luxury on the road, and the K900 is engineered to deliver exactly that. Numerous improvements have been made beneath the surface to ensure a serene driving experience with new features like its stiffer structure, lower drag coefficient, wheel dampeners, and additional insulation in key locations. A new class of comfort. Comfort is paramount in the K900, for both front and rear passengers. That’s why we’ve designed the entire cabin to be a VIP experience that envelops both driver and passengers alike in premium touches that help everyone float on cloud nine. First-class comfort doesn’t have to take a backseat for rear passengers. The K900 offers a rear seat retreat, including standard rear seat heating, infotainment controls, independent rear HVAC, as well as power rear and manual side sunshade. Take comfort even further with available rear wireless phone charger, 14-way passenger side and 12-way driver’s side power rear seats with available ventilation. The K900 continues Kia’s commitment to safety using advancements in passive and active systems like the Pre-Safe seat belt system. Plus, its Advanced High Strength Steel (AHSS) substantially increases body rigidity, while hot-stamping of components in 16 core stress areas helps boosts the body structure for better driving dynamics and a quieter ride. In addition to the full suite of standard active safety features, The K900 sports Kia’s latest safety innovation with its Pre-Safe seat belt feature that actively tightens seat belts in certain collisions if detected, or during certain driving maneuvers. The ultra-advanced 12.3” LCD touchscreen display delivers 1080p output, with new pinch and zoom capability and even a proximity sensor in the controls below that illuminates them when it detects your hand’s approach. And truly innovative split-screen capability allows you to view and manage up to three feature sets at once for even more control and convenience. The K900 comes packed with Kia’s latest technology innovations, making it the most advanced Kia to date. Numerous upgrades include its enlarged 12.3” 1080p touchscreen display, super-premium Lexicon® audio system, plus seamless smartphone integration for all occupants, to make the K900 a tech titan of the road.. The K900 is truly an auto for audiophiles thanks to its super-premium sound system designed by Lexicon® – recipient of a Technical GRAMMY® Award. Lexicon Live is a revolutionary audio algorithm in which individual voices and instruments are identified and re-authored into a precise multi-channel soundstage. That signal is further refined with QuantumLogic™ and Clari-Fi™ sound pushed through 17 speakers via a 900-watt digital amplifier.